So my darling Devilboy came home from pre-school yesterday singing the national anthem, “Avast Our ‘Stralia Fair”, which the are learning as part of the school Christmas concert (no , I don’t get the connection either). But thank Gods, I say, for I was living under a decades long cloud of ignorance to the actual lyrics of our national song. Not only was I unaware that we were a nation of pirates, I’d never before realised that the first line was, and I quote, “Our ‘Stralia’s all fartarse for choice” or that we were “good by sea”. I was particularly surprised to learn that our land abounds in nature’s gifts “of beauty Richard Ray” and that in “joy for strays” we all should sing “Avast Our ‘Stralia Fair”. ‎Devilboy has been quite set on his future career for the best part of a year . In fact, he’s been very specific about it. When we mention that this will keep him terribly busy he simply points out that he’ll manage because we’ll be his “personal assistants”. Read slaves. This morning, completely out of left field, this all changed. When he grows up? The kid is obviously a child prodigy because he’s already well and truly achieved one of those goals and he isn’t even five yet. Having had some time to think it over, I think it’s an excellent career choice. I can see him now, a smiling assassin that silently and stealthily abseils into battle wearing giant orange clown shoes and a spinning bow tie with his black shinobi shozoku, flinging shirukin stars to the left and squirting plastic flowers to the right. There’s gotta be a Tarantino film in that. When Devilboy is quietly playing in his room it generally makes me nervous. Of course you are darling. 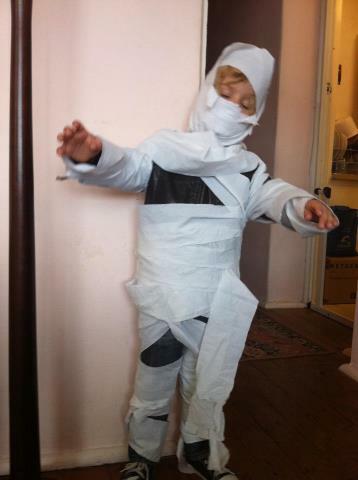 And I’m a mummy that’s off to the local store, because we’re now all out of toilet paper!